By Liam T Smith: I will start this article by referring to a post I read on this site a few days ago. Of course I will not name the writer but the article in question was about current IBF Super Middleweight champion Carl Froch. The writer spoke about how Froch’s upcoming title defence against Yusaf Mack was a “no win” fight for Froch. He also questioned why no one close to Carl had told him to avoid this fight and instead search for a stronger opponent. His reasons for this were that Carl will not receive enough credit should he defeat a “lesser” opponent and at the same time will probably have to retire should he lose. I have to agree with the latter statement as a defeat would almost certainly see the rematch with Lucian Bute fail to go ahead and in turn more than likely see Carl hang up the gloves. However for the first time in his career Carl does not need nor is he looking for the credit. He is simply looking to secure his legacy. 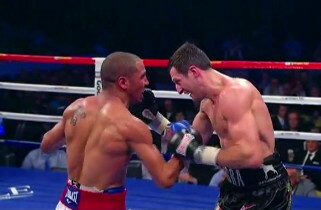 I first came across Carl Froch in his 2008 bout with Canadian Jean Pascal for the vacant WBC Super Middleweight title. I had never heard of Carl before that night and I know I am not alone there. The fight was live on ITV and I happened to see it on the TV listings and thought I would give it a watch. After all it was a world title fight so there had to be some level of ability. I was in for a pleasant surprise. An enthralling 12 round brawl saw Carl Froch become a world champion for the first time. That night I was convinced we would be hearing a lot more about this fighter who seemed to have appeared from nowhere. I was certainly proved wrong on that one. Other than a small side article towards the back pages of the newspaper the next day I never heard the name mentioned again for quite some time. Although in the mean time I watched all the footage of previous fights I could find and I have been a fan of “The Cobra” and his awkward fighting style ever since. Carl Froch is a man who prides himself on being the best. Time and time again, one after another, he gives everything he has to prove that against the highest calibre of opposition out there. He is a warrior. He is relentless. He is a seldom figure in the sport who still believes the only way to be the very best is to defeat the best. He may have fallen short on a couple of occasions but what makes the difference is that he is looking to avenge these defeats and make the best fights out there possible. “The Cobra” has carried this attitude his entire career and that is why every time he steps between the ropes you can rest assured you are in for a thrilling encounter. Not only has he produced such exciting events over the years you can expect more of the same until the day he decides enough is enough. So in a sport which is now full of champions not willing to go out and prove they are the best there is one man stands tall as the exception. If Carl is planning to avenge the Kessler and/or Ward defeats after the rematch with Lucian Bute then why should he be given a hard time for taking a so-called “straight-forward” defence before hand? If there is one man who has earned that luxury it is him. Is Yusaf Mack really as “straight-forward” a defence as people seem to be making out? In my opinion the simple answer is no. Carl has never had any trouble making weight and is always significantly under the 168 lbs limit. Yusaf Mack is a light-heavyweight and could cause Carl some problems if the correct approach is not taken. We can not forget Mack is ranked in the top five in the world. Perhaps at a glance it may seem like a simple defence. However with some research you will find that Carl has in fact done it again. He continues to set himself up with a challenge before a challenge. Carl has always, and will continue to, treat the sport and the fans the way they deserve to be treated. And for that he should always be remembered as the legend he is. Carl “The Cobra” Froch.